The Calamarata is a traditional shape of pasta, typical of the Neapolitan cuisine. Along with Paccheri, this kind of pasta is for real pasta lovers! The thickness of Calamarata and Paccheri is particularly important, and in every bite the pasta taste and texture is more persistent and lasting confronting of the majority of pasta shapes. 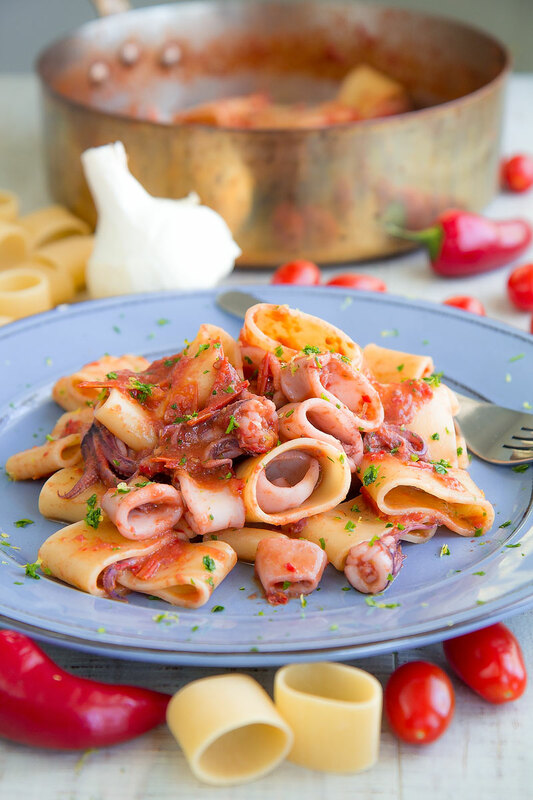 The term Calamarata derives from the most classic sauce tossed with this pasta: a squid and tomatoes sauce, called exactly Calamarata in Italian. In addition, this pasta looks like the squid tubes reduced into rings! 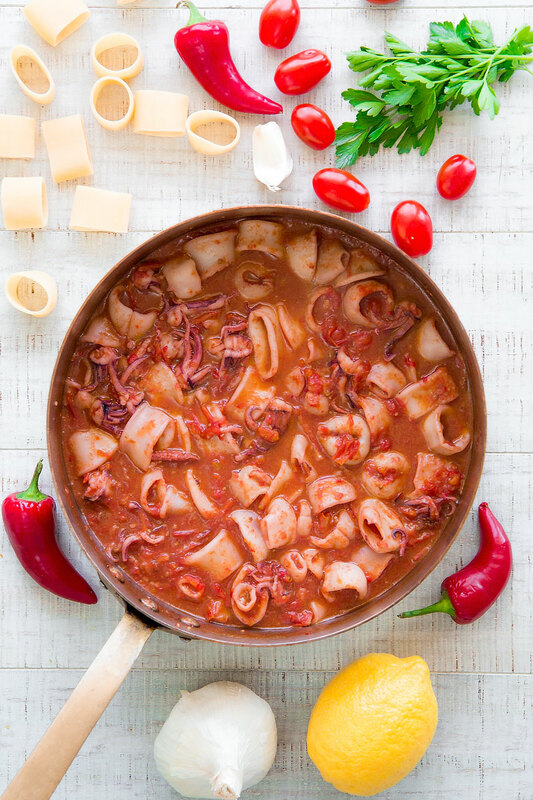 CALAMARATA AI FRUTTI DI MARE – this traditional Italian sauce, often paired with spaghetti as well, can be considered a richer variation of the classic Calamarata. 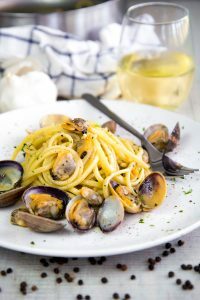 Indeed, the pasta is tossed with a sauce composed by a typical Mediterranean seafood selection: squids, mussels, clams, Fasolari, Canolicchi, and other Mediterranean shells. CALAMARATA WITH SWORDFISH – This is a tasty Sicilian variation of Calamarata, tossed with a sauce composed by sauteed swordfish cubes, fried eggplants, and fresh mint leaves. COOKING THE PASTA – In order to cook the pasta to perfection, bring the water to boil, then add the coarse salt. At this point pour the pasta and cook it “al dente”, stirring gently the pasta every 2 minutes, then raise and toss with the sauce. 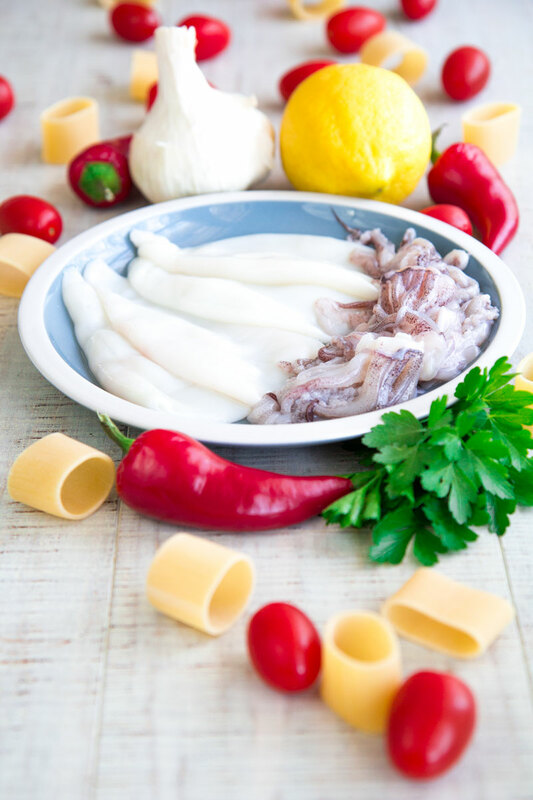 CHOOSING SQUIDS – Even if the market offers excellent frozen squids, I strongly suggest you to use fresh seafood: the taste and the texture is incomparable! 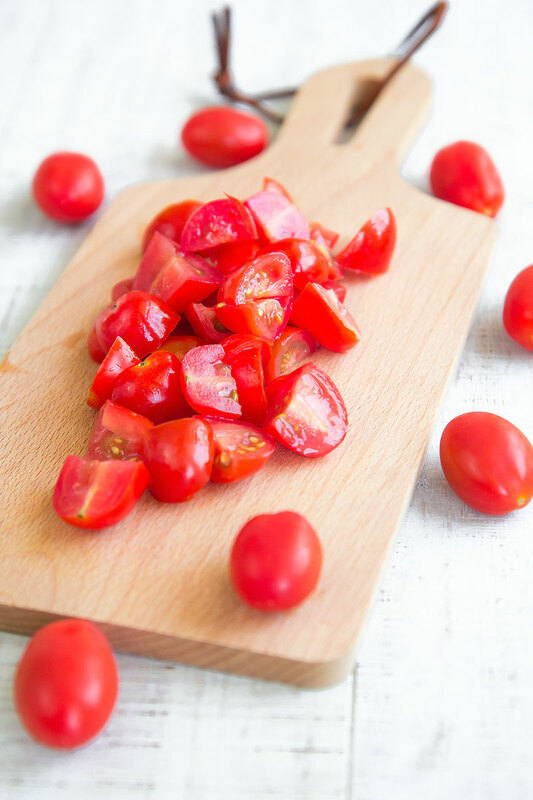 TOMATOES – To prepare a Calamarata to perfection, you want to use perfectly ripe cherry tomatoes. Some chefs love to add a few tbsp of tomato puree: I prefer to use just fresh tomatoes. LEMON AND HERBS – Even if not particularly traditional, I love to garnish my Calamarata with lemon zests. The queen of the herbs for Calamarata is certainly the fresh parsley; fresh mint is not so traditional, but very tasty! First, rinse the cherry tomatoes, and cut them into halves. After that, clean the squids, then cut the biggest tentacles into halves, and reduce the tubes into rings as long as the Calamarata pasta. Finally, store the tomatoes and the squids into two different bowls, and place in the fridge. Now, peel and mince the garlic. 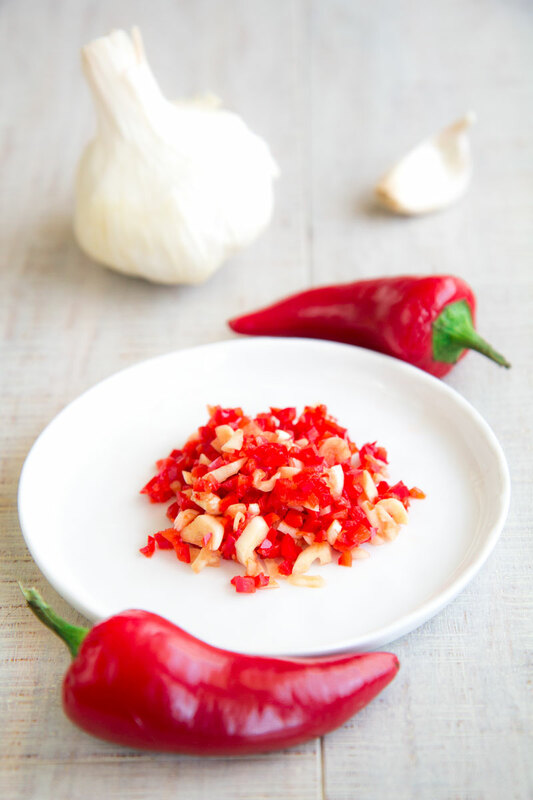 Then, cut the chili pepper into halves, discard the tip and the seeds, and finally, mince the red part. Finally, pour the garlic and pepper into a saucepan along with 3 tbsp of olive oil. Sautè a few minutes over low/medium heat until pale golden. At this point, add the squid rings and tentacles into the pan, raise the flame and baste with the white wine. Let the alcoholic part evaporate a couple of minutes, then add the cherry tomatoes. Simmer the squid sauce 10 to 15 minutes: you want the squids done, but not chewy. In case the sauce is still too watery, raise the squids, store them into a bowl, then increase the flame and reduce the sauce until creamy. Finally, salt to taste. Now, boil the pasta into a pot filled with 5 Qt of water and the coarse salt. 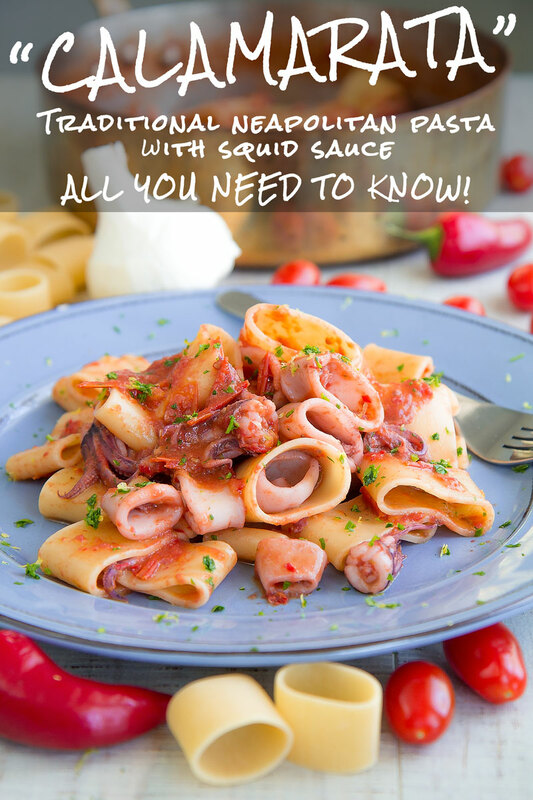 Raise the pasta "al dente" and toss with the squid sauce. Eventually, garnish with minced parsley, black pepper, and the grated skin of an organic lemon. Serve immediately.